Yarrow, Achillea millefolium, is a warrior’s plant. Named for Achilles, the mythological Greek hero of the Trojan War who was nearly invulnerable in battle. And for centuries, Yarrow has been considered “battlefield medicine”, because of its ability to staunch the flow of blood. How does it work? I like to describe it like this: Yarrow helps restore homeostasis to the circulatory system. If you’re bleeding from a wound, the pressure in your blood vessels has changed – much like when a spaceship’s hull is punctured and oxygen is leaking out into space. (How did we possibly describe herbal actions before science fiction movies?) Yarrow helps to stop bleeding by re-normalizing the pressure throughout the body, so that you don’t vent all your oxygen out into space – I mean, bleed to death. 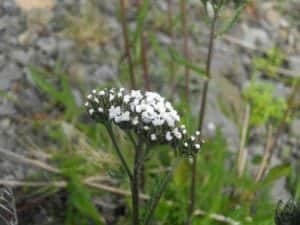 Yarrow is disinfectant – whether you’re at home or on the trail, Yarrow can stop bleeding very quickly and keep the wound from getting infected. You can carry Yarrow with you when you’re hiking, or keep it on hand if you’re the mother of girls and boys with scraped knees and elbows. In general, for direct applications to a wound, I prefer a very strong infusion of the aerial parts if I have access to water to boil. If not, Yarrow tincture can be applied directly to a wound, but it will sting because of the alcohol. Mixing it in clean water, if it’s available, can reduce the sting. If you’re prone to nosebleeds, Yarrow is also very effective, but you can just take the tincture orally in this case. Yarrow is also fantastic emotional armor – which may seem weird, but only because we haven’t invented the microscope that sees emotions yet. But think it through: Yarrow helps equalize blood pressure physiologically – emotionally, that has effects too! You feel more stable, even in a tough situation. And yarrow even has protection in the name – the myth of Achilles says he was dipped in magical armor, which was made him almost invulnerable. Sometimes science we haven’t figured out yet looks like magic, but however it works, Yarrow definitely can make tough things easier! If there are situations where you feel vulnerable, or if you have to gear up emotionally to do things that are difficult, give Yarrow a try! If you’re thinking about first aid, Yarrow is your best buddy – but you probably want to pack a few more things. Here’s a blog post about how to make your own herbal first aid kit! 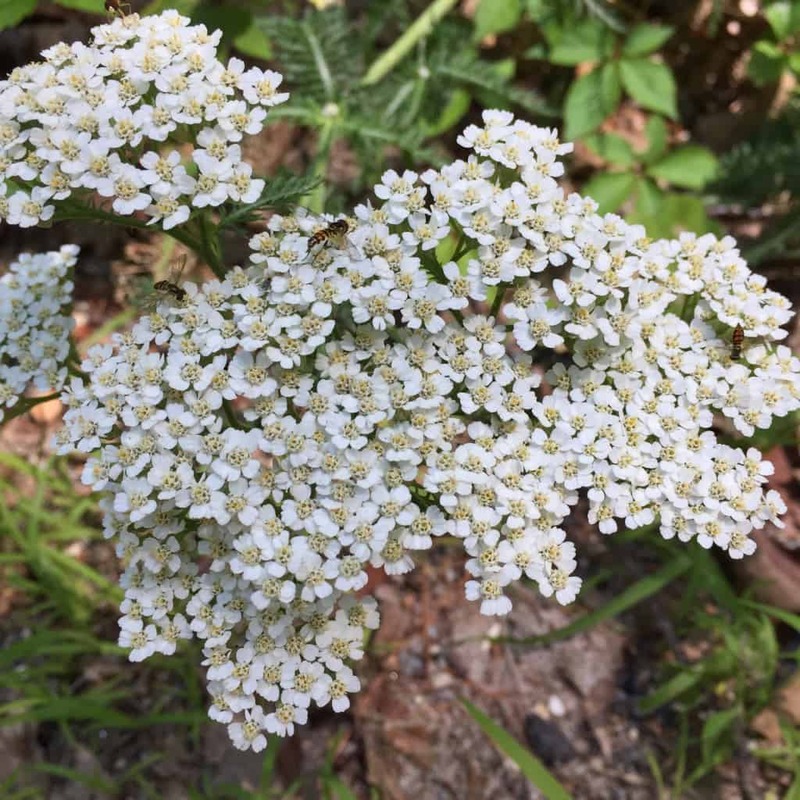 And if you’re thinking about emotional first aid, check out our podcast episode on the topic – it features Yarrow and a list of other plants that can be extremely useful in and after stressful and traumatic situations. Yarrow grows in Iceland too, and is a big part of Icelandic herbal tradition (practical for all those Vikings!). We took this photo of Yarrow in Iceland when we were visiting for our honeymoon. We met up with Anna Rosa Robertsdottir, a fantastic herbalist in Reykjavi­k, who took us for a great herbal adventure. If you haven’t checked out her book, Icelandic Herbs, you definitely should! You can get it on Amazon, order it from your local independent bookstore, or check out her website directly – her book is one of our favorites! A few of the plants only grow in Iceland, but most of the herbs are relevant to the rest of us too, so grab a copy for yourself. But wait – there’s more! 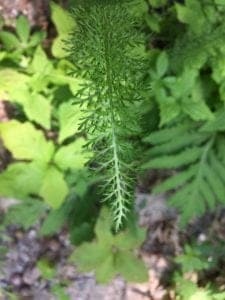 Yarrow is a fantastic friend for fevers, lovely for varicose veins, a digestive bitter, and quite tasty in your own home-brewed beer or mead! What did I leave out? What’s YOUR favorite way to work with Yarrow? While walking my rather large dog this past summer, he got overly excited by another dog. He jumped up and raked his claws across my right arm, resulting in two long scratches – one pretty bad. I take a blood thinner, so of course I had blood running down my arm in seconds. I immediately started looking along the road for Yarrow. It didn’t take long to find. I picked four long leaves and laid them across the wounds and held them there while I hurried home. By the time I got there not only had the bleeding stopped, but the wounds were closed up, even the bad one. I will never be without Yarrow!